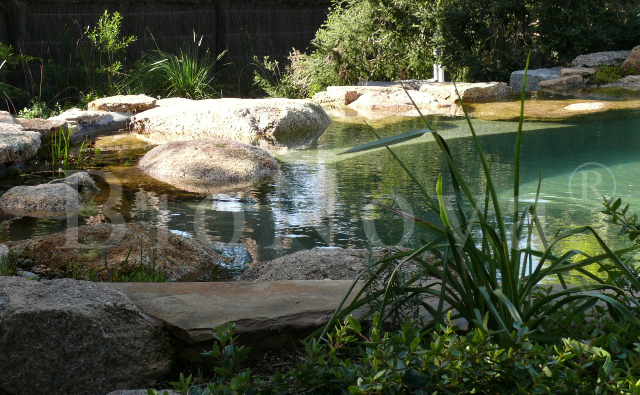 Natural pools and ponds are a complete reinvention of the swimming pool. Aquatic plants are used to clarify and purify the water. Learn more. KenCairn Landscape Architecture is a certified designer and dealer for BioNova® Natural Swimming Pools. Natural Swimming Pools are a complete reinvention of the swimming pool where aquatic plants are used to clarify and purify the water instead of toxic chemicals. Natural biological filtration makes an ecologically friendly pool, allows for greater environmental sustainability and very low energy consumption while creating beautiful, unique and fun designs for a healthy chemical-free swimming experience. We design these pools and ponds throughout Oregon, including Medford, Ashland, Grants Pass, and Portland.